Alternative Eden Exotic Garden: I don't give a Fig! Or rather I do grow a number of different figs with ornamental properties. A couple have featured in our blogs before but as we have several types I thought it's worth doing a dedicated blog about them. The following are the figs we grow in our garden. Probably the most well known Fig variety and reliably hardy for most parts of the UK. We have grown this for a number of years and are now getting a reasonable crop of figs each year, provided we beat the squirrels to them. The fruits are delicious and a delight to eat once ripened but the foliage is good enough reason to grow them in your garden, exotic looking and lush! 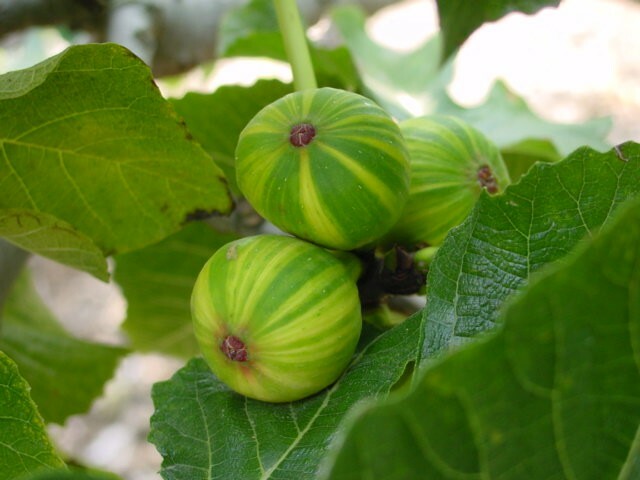 Another well known fig that grows well in the UK, the fruit is more pear shaped than the 'Brown Turkey' variety, however the main reason for us to grow this one is for the very ornamental leaf shape. We have only recently bought this particular fig, so will probably not plant it out until next year as it's quite small. A relatively recent introduction and an extremely interesting fig, this one is grown purely for the distinctive leaf shape rather than the fruit. Reads Nursery report that this is hardy down to at least minus 13C (8F). A stunning plant, that also appears to be quite hardy. Our plant was planted out last year and grew quickly, this survived the winter (-10C) although did have some die back in the new growth, however all the older ripened woody stems survived the winter with no damage. A very large leafed fig, possibly the largest (featured in this blog) that is usually grown under glass in the UK for the fruit but is hardy enough permanently grown outside in our location. In our case we are more interested in the very large leaves. This is going to be magnificent once its bigger. Another interesting fig, with leaves almost as big as 'Adam' (reputedly second biggest of the lot), this variety is from Israel and needs a warm spot to fruit in the UK. This one is a real stunner and something of a curiosity with striped fruits looking like little hot air balloons. The variegation continues onto the stems and is most pronounced on the new growth. This one needs the heat of a greenhouse to set the fruit so we grow this under glass, although we are more interested in the way the fruit looks than how it tastes (apparently it is a tasty fig). With so many interesting leaf shapes and sizes and the bonus of fruit on many figs every garden should have one (or several!). I enjoyed this post on figs, as I have been wanting one. I never realized there were so many different leaf shapes! They are not easy to find here, but I am determined to get one! They are quite interesting and obviously very exotic but we can't have them up here. Very nice though. That spotted fig is something else, very neat! Nice new design to the site, good flow it all. Summer is certainly a nice time to be a gardener. Wow, you have some wonderful figs! I am growing 'white Marseilles', my first attempt at growing figs. It was only a few inches tall when I planted it in a pot. It was growing well and even producing a few figs when just this week the leaves began to develope dark spots, turn yellow, and fall off! I am quite worried about it. Wow. Ice Crystal is a must! Never heard of it or indeed knew there were so many varieties. Brown Turkey, which I've only ever grown, now just seems rather pedestrian! Thanks Holley, glad you enjoyed the post :) I'm also rather surprised that Fig varieties are still difficult to source there. Glad you like the new design Nat! :) Panachee is a novelty fig. Lovely figs! I've been nursing some baby plants, and have finally finished part of the work on front of our house. This means I can plant my fruit trees soon! Thanks for dropping by Lisa and Robb, and good luck with your fund raising :) Glad to know you've finished part of the work on the front of your house and are able to plant out some of your fruit trees. I am a fig collector from France and i am looking for the variéties Adam and 'Ice Christal'. Would you be agree to exchange cuttings? I have 60 different varieties of figs whith some very hardy. I can send you my fig list if you are interrest in.